WELCOME TO PARADISE, YOUR ROOM IS READY......... Visit one of the most romantic hideaways in the Pacific Northwest. Located high on the bluff overlooking historic Port Townsend - the Olympic Peninsula's Victorian seaport - the Ravenscroft Inn commands a sweeping view of snowcapped mountains and dazzling water. 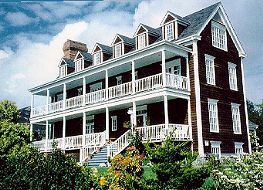 The Bed and Breakfast is noted for its Colonial style, a replica of a Charleston Single House. The Inn offers a unique combination of attentive hospitality mixed with a casual aire that spells comfort to its guests. Experience awakening to a magnificent sunrise while anticipating a sumptuous and bountiful breakfast, prepared especially for you. The Ravenscroft Inn and Port Townsend will meet all your getaway requirements: comfort, scenic beauty, theatre, unparalleled dining, boating, biking, fishing, kayaking, and hiking. A splendid jumping off point to national and state parks, including the Olympic National Park and the Hoh River Rain Forest. Whether traveling for business or pleasure you will find this corner of the world suits you. Rates from $67-175 8 rooms, all private baths. two suites. Rms. with fireplaces, soaking tubs, view. Accept all major Credit Cards. Off season rates available. This and other Port Townsend Bed and Breakfast Inns can be found here in The Register.